I’m a peach girl. I was actually born a Georgia Peach, although we moved to Ohio when I was two, so if it came down to any sort of loyalty battle, I’d claim Ohio as “my” state. Regardless, my favorite pie is peach, and nothing smells as wonderful to me as a fresh peach! Except maybe a baby’s head. Or pizza. Or french fries. Ok, fine, lots of things smell wonderful to me. Anyway, my Dad scored me some free end-of-harvest peaches at the local farmer’s market. 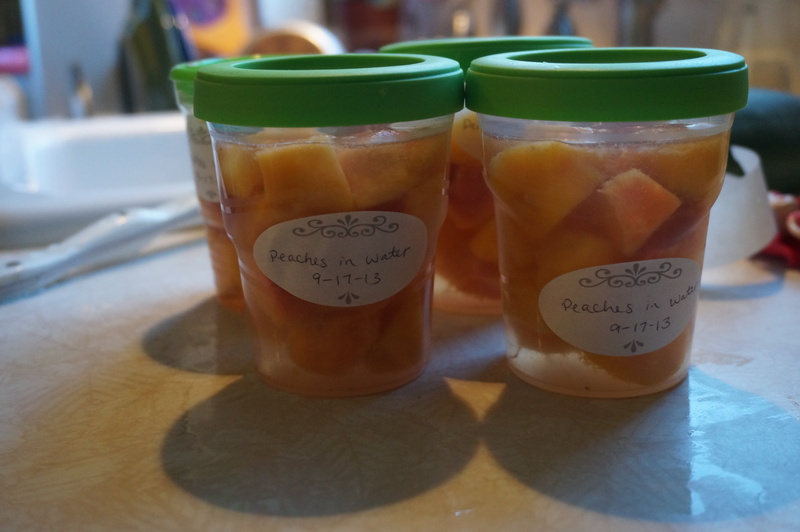 Out of three 5-gallon mostly-rotten peaches, I rescued about 4 tiny pints worth of delicious, very ripe peach chunks. While I could have canned them, I have five little kids needing my attention today and I just wanted to be done with them. So I packed them into freezer containers. (Side note… I’m not all that impressed with Ball’s freezer jars – even their newest model. They are just not easy to use because the lids on both models are so finicky! And I can’t trust myself to freeze the glass canning jars anymore because I’ve managed to break three or four already, either over-filling them or putting them in the freezer while the contents were still hot. What can I say? I learn the hard way.) Instead of using syrup, which would have taken additional time to prepare, I just packed them with filtered water and stuck them in the freezer. Done. What to do with these in the future? My Grandmother-in-law has a FANTASTIC recipe for a barbecue peach sauce that is served with pork tenderloin. It’s a little involved, but it’s so totally worth it. I would have just made the peaches into this sauce but I don’t have all the ingredients on hand. And it would have taken more time. And I wanted to be done. This is an excellent meal for company, parties, or Tuesday night dinner! 🙂 There’s two options: one that prepares the meal to be served out of a crockpot (ideal for the party scene), and another one that uses the grill and make a more impressive centerpiece (ideal for company). I’ve tried it both ways and found them equally delicious! For sauce: Saute bacon and chili in large saucepan over medium heat until bacon is crisp. Add onion and garlic, saute 5 minutes. Add Worcestershire sauce and peppercorns, stir 1 minute. Add peaches, saute until translucent, about 5 minutes. Add orange juice, ketchup, lemon juice and hot pepper sauce. Simmer until sauce thickens enough to coat spoon thickly, stirring often, about 30 minutes. For pork: Brush tenderloin(s) with oil to coat. Arrange park on rimmed baking sheet. Mix pepper, salt, and garlic salt in small bowl to blend. Sprinkle over pork. Bake pork at 350* for 30 mins. Slice pork into 1/2 inch slices. Transfer to slow cooker, add sauce, cook on low for 1 hr. OR Grill tenderloin(s) until brown and meat thermometer inserted into center registers 140*, turning occasionally with tongs, about 18 minutes. Brush pork all over with some of the sauce, about 3 minutes longer. Transfer pork to work surface, let rest 10 minutes. Rewarm sauce in pan. Cut pork crosswise on slight diagonal into 1/2 inch slices. Arrange pork slices on platter. Drizzle with sauce, serve, passing remaining sauce separately. Next time I make this I’ll try to remember to take a picture of the finished result!